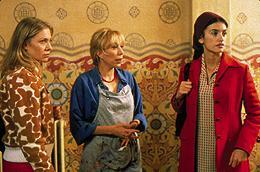 1 All About My Mother A Madrid nurse (Cecilia Roth) loses her son. In her grief, she goes to Barcelona, where she tends to several wounded creatures: an aging actress (Marisa Paredes), a hard-luck nun (Penélope Cruz) and a chatty transsexual prostitute (Antonia San Juan). Sounds like the usual menagerie for a Pedro Almodóvar movie, and this one has all the kooky verve of his earlier comedies. But there's a depth and warmth that proves Spain's bad boy has reached a vibrant maturity. If this movie doesn't touch your heart, consult a cardiologist. You may be missing something. 2 The Matrix The cool and daunting premise--that life as we know it is a computer simulation--gives the writer-director Wachowski brothers the chance to make a probing, throbbing special effects thrill-ride, a Mensa macho epic with a wit as quick as its flying kung-fu feet. The film crams the Bible, Greek myths and theoretical math into a comprehensible good-guys-vs.-big-bad-universe plot. If the movies of the next millennium have to be cyber-driven, let them be vehicles as potent, handsome and sleek as this one. 3 Tempting Heart Sylvia Chang's valentine to missed chances in love spans two decades of ambition and rue with a dancer's grace. The leads, Takeshi Kaneshiro and Gigi Leung, prove beyond a doubt that star quality is alive and well in Hong Kong. 4 No One Writes to the Colonel In a Mexican village, a retired officer (Fernando Lujan) and his wife (Paredes again) live on in defiance of age, poverty and, frankly, logic. Arturo Ripstein's version of the Gabriel Garcìa Màrquez tale has a humid wisdom that indulges one of our stubbornest addictions: to keep on hoping. 5 Tarzan and South Park: Bigger Longer & Uncut Here's a plausible argument: there were more good cartoon features made in the U.S. this year than live-action films. Disney alone had Tarzan (its snazziest and most affecting feature since The Lion King), Fantasia 2000 (a rhapsody of innovative animation) and, via Pixar, that cunning computer-with-a-heart Toy Story 2. The Iron Giant nicely updated Ted Hughes' classic tale of nuclear anxiety. And what can we say about South Park that the film itself didn't sing in unprintable four-letter words and the cleverest original movie score in decades? Just that it's devilishly, hummably funny. 6 Rosetta She is the teenager who will do anything to get any job, however menial. This dour Belgian drama from Luc and Jean-Pierre Dardenne is both grinding in its bleakness and inspiring in its intensity. Emilie Dequenne plays Rosetta with a blank fury that suggests a medieval saint or a modern assassin. 7 The Color of Paradise A blind boy (Mohsen Ramizani) and his widower father spend the summer together and apart--then violently together again --in another gem from Iran, home of the world's most reliable art-film industry. Writer-director Majid Majidi finds tension and heartache in the tiniest incidents of rural life. 8 The Straight Story And a true one too: old, crippled Alvin Straight (Richard Farnsworth, in the performance of the year) motors across the American plains on a John Deere lawnmower to visit his ailing brother. Goodness was rarely so compelling as in this poignant, unforcedly uplifting road movie from weirdmeister David Lynch. 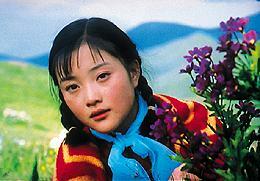 9 Xiu Xiu: The Sent-Down Girl During the Cultural Revolution, a naive, vivacious Beijing teenager (played by the Chinese charmer Lu Lu) is sent to faraway Sichuan, where she is befriended by a Tibetan herder (Lopsang) and brutally misused by everyone else. A daring, beautifully observed parable of political and sexual betrayal from actor-turned-auteur Joan Chen. 10 My Intimate Enemy Actor Klaus Kinski, a divine madman (all right, skip the divine part), made five terrific films with Werner Herzog, including Aguirre and Fitzcarraldo. In this horrendously entertaining documentary, Herzog recalls his evil twin of a star in interviews and film clips. A pungent reminder that all movie people are nuts. A Poor Year for French Whine: Once the French blamed Hollywood for their ailing box office. Now they complain that local critics are poisoning the air with hostile reviews. Directors want reviews to be withheld for a week, so that audiences have a chance to see films unpolluted by critics' rancor. Another solution would be: make better movies!